Wishbone Day: Why Sandy will be wearing yellow 6 May! Why Sandy will be wearing yellow 6 May! Thanks for sharing with us, Sandy!! "In less than a month I'll be taking part in Wishbone Day - a day of international awareness for Osteogenesis Imperfecta. Obviously it's the condition that I was born with, but there are hundreds of reasons beyond myself for why I will be rockin' out in yellow on May 6th. The point of dedicating one day or month out of the year for a special cause isn't always to look for a cure. When our Congress person or President signs an official proclamation for an Awareness Day, that piece of paper doesn't translate into more sales in shopping malls. It doesn't mean that those for whom the day is dedicated to should expect freebies or hand-outs. What it does mean is a time to recognize, empower, advocate, educate, comfort, give -- to simply come together and acknowledge our shared experiences, and in doing so make that be the difference for someone else. It only has to start with one person. And for me it began with you. Somehow when I made my first blog post last May you came and found me; you read it, then you continued to read, then we got to talking and the rest is history. You're that one person who began to help me break barriers and then when a couple hundred more came along you encouraged me to continue. So, to get back to my reason for why I'll be wearing yellow on May 6th? You. For all the hundreds of you's: let's shine in yellow together!" WHY YOU'RE ROCKIN' OUT IN YELLOW on 6 May? Thanks Joe! Hope you keep coming back to check out the stuff coming through in the lead up to Wishbone Day 2012. We're excited! 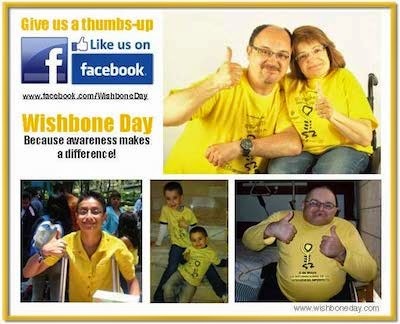 Why will you be wearing yellow on Wishbone Day? Need proof that your efforts make a difference? Wishbone Day Support Team 2012!! Can I buy a Wishbone Day Shirt? Wishbone Day on a Sunday? Wishbone Day 2012- what will it look like??? Getting ready for Wishbone Day?